Be enchanted by the Harley-Davidson purr and graceful moves of the spotted felines at the Daniell Cheetah Breeding Project. 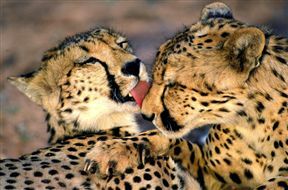 This once-in-a-lifetime experience offers an interesting, personalised tour and the chance to interact with the cheetah. Visitors are encouraged to touch the cats and have photographs taken with a few of them. Established in 2001, the project started with only three cats and has grown in leaps and bounds. The maintenance of pure genetic lines and public awareness of the importance of conserving this amazing species is the chief focus. The Cheetah Walk experience costs R150 and includes a slice of cake and beverage at the Padstal. Walks need to be booked at least two days in advance. Children 12 years of age and older are allowed to participate. Open seven days a week, the Daniell Cheetah Breeding Project can be found on the R75 National Highway 80 kilometres from Port Elizabeth Airport. On site is The Padstal offering light meals, refreshments and a gift shop. Daniell Cheetah Breeding Project is 15.5km from the centre of Kirkwood , the nearest airport 64.5km (Port Elizabeth Airport).